I'm one of those people who likes memes promising to burn down the house when one sees a black widow spider. So, I was understandably anxious when they announced “Arachnids in the UK.” In the end, this fear would be surpassed by the only thing I hate more than spiders: rich American men who like building hotels and have plans to run for president. Can our group of friends overcome these odds and save the day? My spidey sense says yes! Also, spoilers, I've seen the episode, as should have you if you're listening to podcasts about it! 142 - The Arrow of Time's Foolish ChrEaster Special! While Joseph sits the rest of the year out, Matt and Gabe discuss the exciting, yet oddly still controversial, announcement of the first woman to portray our beloved cell transforming Time Lord. Matt and Gabe delve into Jodie Whittaker’s achievements and speculate what kind of a Doctor she might be, what kind of companion she might have, and what kind of show runner Chibnall might be. For your WhoTube enjoyment, check out this amazing tribute to some of the women in Doctor Who called “Women Of Doctor Who” by Beagonfei. Much like Moffat, we had a clever plan. Also like Moffat, we didn't execute that plan as well as we thought we would. We rushed to record a podcast for you right after the episode aired, then life got in the way of this episode's editor. That being said, here you go dedicated Arrow of Time listener. These are our thoughts, feelings, hopes and dreams after watching "The Doctor Falls." It was the best of times, it was the worst of times. Season 10 (series, if you're English) has been a breath of fresh air, and Steven Moffat has been Moffat-ing it up. Peter Capaldi has fulfilled his promise as the Doctor, and yet it's been spoiled that his time is ending. I could keep listing things, but there’s only so much space. Ride along with us as Matt, Joseph and Gabe examine “World Enough and Time” from top to bottom. Children get older, and we're getting older, too. One way we can tell is that we can't hold our liquor like we could at the beginning of the Moffat era! In any case, we had a lot of fun talking about "Empress of Mars," and we hope you have some fun listening to us get silly on the podcast this week. Joseph, Matt, and Gabe chat about Steven Moffat’s triumphant, or at least enjoyable-but-still-plot-hole-ridden episode, “Extremis.” I mean, this is his last season, he’s got to still be wanting to tell stories in his last ride right? Today I heard some tourists complaining, "Geez, if you're not careful crossing the street here, they will hit you and kill you!" I can't imagine where they were visiting from, because common sense says that you should always be careful crossing the street! It's sort of like going to space; never leave your TARDIS air bubble without looking both ways! As you may have surmised, this week we talk about "Oxygen." Spoilers, we go through a lot of it talking about this episode! Knocking on wood has many meanings. It is a way to let someone know you're at the door. It can be a way to snag some extra luck. It is also a divisive episode of Doctor Who, at least amongst Joseph, Matt and Gabe. We probably cover almost every possible opinion of "Knock, Knock," including an existential look at the title itself. Please have a listen and let us know your hot takes on the episode. No matter how often the current incarnation of the Doctor tries to convince us he's a big meanie, the human-loving truth always comes out. "Thin Ice" fully displays this M&M like quality, showing the Doctor to be brittle on the outside, soft inside and subtly sweet in the end. This week, we discuss all this and a lot more that may or may not be related to this episode, Doctor Who or even this universe! We've been gone for a while, but we're back, for at least one week in winter, anyway. Sort of like a certain show we all watch, whenever they can be bothered to make it. Don't dwell on that too much and (hopefully) enjoy as Matt, Joseph and Gabe discuss the "Return of Doctor Mysterio." One thing is assured, the Arrow of Time team's superpowers include tangents, dissing Moffat, and, of course, drinking! Another superpower, disappearing without a trace... See you all when we see you! Christmas is a time for loved ones, special memories and Doctor Who. Usually, Doctor Who Christmas specials come with a bit of death, and “The Husbands of River Song” doesn't disrupt the status quo. At least this time they were mostly bad guys that got coal for Christmas. Spoilers! To unwrap our thoughts just listen to Matt, Joseph and Gabe delve into the tangled history (and future) of the Doctor and River, whether or not humans can become Time Lords and Ladies and how days can seem like years on Dirillium. We might also give some props to a certain show runner. Don't make puddles... everything will be alright. First we have "River Song Fan Music Video" by Richard Pearce (https://youtu.be/szc_3raxwuE). Then we add some spice with “Peppermint Winter Doctor Who” by SparkyDragonSlayer (https://youtu.be/eU4yYv2q_2A). Another year, another series, another podcast where we gather together and talk about what we’ve been talking about for the past several months already. In this the season of The Hybrid, Matt, Joseph, Gabe, and Susan act as your personal audio tour guides through a series of two-parters, replicas, and twinsies. We've all heard the expression that saying goodbye is hard to do. That is especially true for a certain Time Lord we all know and love. In the series nine finale, “Hell Bent,” we look at the Doctor and his literal trek to the ends of time to try to save his friend. Along the way, we have to deal with Moffat's potty mouth, Rassilon's consistent badness, and [the most important question] of how on Earth Clara and Me can get away with a TARDIS disguised as an American diner if they go to Ancient Egypt. Timeless questions for the pocket time traveler. All things must end. It is an axiom accepted by scientists, philosophers, Mister Spock and our own dear Clara Oswald. It is not a sentiment shared by the Doctor. At least not this Doctor, this time. At its core, "Hell Bent" is an episode about Doc 12 and his assertion that "summer never has to end" if you steal a time machine. On first viewing, "Hell Bent" seemed like a mess, tied together loosely by scenes of the Doctor telling a story to a woman who looks like Clara. However, subsequent viewings and consideration reveal that this is an episode that has a lot of meat and manages to succeed in spite of itself and the musings of writer extraordinaire Steven Moffat. When the Doctor awakes in Nevada, stumbles into a diner that looks like the place where he met the Ponds in "The Impossible Astronaut" and is met by a waitress that looks a lot like Clara, it seems like maybe he has gone back into his mind palace and this isn't really happening. The lack of recognition says different. Also, there are early clues to Moffat's misdirection. We know the diner was in Utah, not Nevada, for example. The Doctor begins to spin a tale of how he got to this place and his quest to fill the lost memories of Clara. I loved hearing his guitar version of Clara's theme, which was beautiful and haunting. In retrospect, it was also fun to watch Clara toying with the Doctor, leading him on with statements like, "She must have been very important to you." The scene when the Doctor systematically deposes Rassilon with just a few words and no violence was powerful. It embodied everything we have come to know of the Time Lord who hates soldiers, guns and death. One of the first Gallifreyian soldiers to throw his allegiance to the Doctor said, "The first thing you notice about the Doctor of War is that he's unarmed. For many, it's also the last." That is slightly betrayed when the Doctor calls in four armed airships to cover Rassilon, but the point is not completely lost that "words are his weapon." Moffat had teased that this episode was a "big Star Wars" episode, and I'm actually glad for this spoiler because otherwise, I would have groaned out loud at the scenes and music on Gallifrey. It wasn't an homage to Star Wars, it was wholesale hackery. Knowing in advance that he was going for that, it let me groan internally and carry on with the story. With Rassilon and the High Council out of the way (for this episode anyway... count on their return), business can get back to stopping the hybrid, right? Sure, but first we need help from people who don't wear bad hats that might cramp the Doctor's style. He has always leaned on his companions, so it isn't a surprise that the Doctor requests getting Clara's help via a Time Lord extraction chamber. It clearly is quite a feat as it requires at least three techs to run the thing. Spared certain death, Clara seems momentarily taken aback. The General explains that "they always tell them" that their death is only spared for a few minutes while they help deal with a problem. It is here that we learn that the Doctor's plan was always to save Clara. When the Doctor asks for a neuro block, I thought Moffat telegraphed the ending for us - that the diner scenes were the Doctor talking to a Clara who had no idea who he was. The scene also presented a huge problem in that it shows our peace loving, gun hating, perpetually unarmed Doctor shoot the General. Sure, he confirmed that the Time Lord still had regenerations remaining, but it was still difficult to resolve with our Doctor. He was unravelling, and at least Clara recognized and challenged this angry Doctor. The Time Lords were responsible for her death, the Doctor reasoned, so they needed to help resurrect her. "I have a duty of care," he says. That perfectly sums up the depth of his feelings for her because the way he delivers the line betrays that the reason he saves her runs deeper. The Doctor did not go to such ends to save the Ponds, and he actually abandoned countless companions in the past. Since "School Reunion" we've had the idea that the Doctor has a problem with good-byes. River really drove the same point home in "The Angels Take Manhattan" when she tried to conceal her broken wrist because she didn't want the Doctor to see her vulnerability. In Clara, the Doctor found the rare companion where good-bye hurt too much. The issue of the hybrid also seems open ended. He may have been the hybrid standing in the ruins of Gallifrey when he goes to the end of time to try to save Clara. Me was also there. Could she be the hybrid? Clara didn't actually leave the stolen TARDIS, so Me's theory that the pair of them together are the hybrid doesn't quite work. This may be the new Fields of Trenzalore from Moffat for a new Doctor. I really appreciate that Clara isn't dead. As long as she is alive, there is hope that the Doctor, Clara, Me or someone else will find a solution to her end. Avoiding endings is what this Doctor is about, and in spite of how illogical that may be, I at least sympathized with his plight in this instance. Doctor Who is at its best when the Doctor is flawed. This Doctor is brutally flawed, and he eventually comes to realize it, but doesn't actually change. "Nothing is sad until it is over, then everything is," he laments to Clara in the diner. However, the Doctor is still the loveable Time Lord when he thinks he won and chirps, "I'm going to invent a flying submarine. Why? Because no ever has and it's annoying!" We've seen flashes in the past of the Doctor thinking himself a god only to be grounded by reality. Think "Waters of Mars." In this episode, a desperate Doctor proclaims, "The universe is over! It doesn't have a say anymore! As of this moment, I'm answerable to no one!" Like that case of failing to save Adelaide in the "Water of Mars," this Doctor recognizes his own avarice. When clever Clara attempts to reverse the polarity of the nuero block, the Doctor seems to accept that they can't have a happy ending and one of them must forget the other. "Look how far I was willing to go for fear of losing you?" he asks. "This has to stop. One of us has to go." In his good-bye to Clara after having his memory of Clara erased, the Doctor tells her, "Run like hell because you always need to. Laugh at everything because it's always funny. Never be cruel. Never be cowardly. And if you are, always make amends." The Doctor's contrition appears to be letting go of Clara. However, as you may expect, the Doctor then begins a search based on the hole her memory left in him. Clara, as she has done throughout her tenure with 12, offers a perfect mirror. She's similar, but better than he is. She says, "We all face the raven at the end. That's the deal." The Doctor, by rejecting this simple truth, is both endearing and tragic. That's why I watch Doctor Who. The episode wasn't without its issues. A big one that I kept coming back to was, if the hybrid was so important, why didn't the Time Lords question the Doctor before? Apparently, he learned of this prophesy when he was a young Time Lord at the Academy, so they had plenty of opportunity. Also, if the Mire had medical repair technology, why didn't more Mire survive, or why didn't other races steal their technology? In my opinion, the title sequence is an ongoing problem, but I did cheer out loud when I saw Jenna Coleman's name one more time. Like the Doctor, I don't like saying good-bye to dear friends. All things considered, it was a good, if not slightly flawed, glimpse into the mind of our beloved Doctor. So close to a god, he always falls short. That's interesting. That's why he needs companions, and I can't wait to see who the next one is. The general idea of a scary movie/show/book/billboard is that the premise is so frightening it keeps you up at night. It's even right in the title of this week's Doctor Who snooze scare-fest: "Sleep No More." However, the actual moral of the episode is that you should sleep. Quite a lot, actually. To the point that sleep is really the oldest thing. The most important thing. Basically, it is the very thing that makes us human. As you may infer from my attempted sarcasm, this wasn't a favorite of ours. You might say at least one of us really didn't care for it at all. If you want to know who, you're just going to have to listen! I wrote this script suggestion and lovingly wrapped it around a brick. Apparently, my prayers were answered, so we now toss this brick of an episode gently through the window of your hearts. Witness the Doctor's midlife crisis, only short a brand new convertible. Roll your eyes with glee as we discuss the lamest soldiers ever portrayed on screen. Bite your nails to the new improved Clara. And watch your step as giant electric tribbles abound. All this and two other things, in the most exciting Arrow of Time episode this week. And if you feel there just aren't enough Zygons in “The Zygon Invasion,” the good news is that there is a part two on the way! Our being correct average has experienced an unexpected boost this season as at least one of our number has correctly deduced “the twist” twice in a fortnight. Has Doctor Who strayed into the realm of the predictable? Maybe! But that’s not a problem when Toby Whithouse delivers a solid conclusory episode like “Before the Flood.” Now let burst the dam of your ears so that our podcast might flow into them like so much water over a mock Russian village! Rainbows, unicorns, sonic screwdrivers! Folks, it looks like the stars have aligned and we have a great episode to discuss this week in "Under the Lake." Except somebody (Joseph) thinks it should be called anything else. Literally. We don't want to sound like fan boys, but that Toby Whithouse chap is pretty good. Could he be the new Moffat? Embrace the heresy! 112 - Why Is Any of this Happening?! We don't like to boast, but when we predict the outcome of a Moffat plot months in advance, we need to say, "Told you so!" If Moffat stays on as showrunner, we may need to change our motto from 20% right to 21.5% right (because he keeps doing the same thing over and over, you see). Listen to our subdued revelry in correctness and critical critique of "The Witch's Familiar." Not for the faint-hearted. It’s our eleventy-first birthday, but all the presents are for you, kind reader, as long as you can accept that the presents are in audio form and there’s only one of them. We also bring questions, such as this classic brain teaser: what if you told a BBC exec that they were looking at a man who would go on to tell the same story over and over again? Would they still hire him? No reason to ruminate, because they did, and that man is none other than Steven Q. Moffat! Now unwrap our latest podcast where we talk about (and reserve judgement on) “The Magician's Apprentice” and test our knowledge with Doctor Who: The Official Quiz Book by Jacqueline Rayner. Spoilers: we didn’t get A levels, or whatever the English do for school these days. With season 9 imminent, the rampant rumors and wild speculation are turning into confirmed spoilers and loads of trailers. As we like to do, we try to examine and reexamine every tidbit of information. 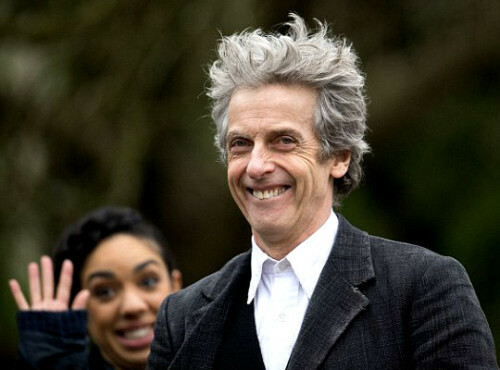 It's the way we show our excitement for the Doctor and Clara's return. Also in this episode, Christopher Eccleston really wants to make us all sad. If there is one thing that a podcast should do, it is certainly not record on a regular basis. If there's a second thing it shouldn’t do, it is quickly post recorded podcasts. By those measures, we're doing fine! So, if you don't know last month's Doctor Who news, this podcast is for you! Join Matt, Joseph and Gabe as they discuss and speculate about "news" and rumors not-quite-fresh from Cardiff. In this glorious “Time and a Half” episode, Matt sits down with die hard New Who fan Kristi. They discuss where the show is going, favorite Doctors, and the best method of trapping people into watching the current show.